This track is intended as an exercise for students who have recently been introduced to 7 Barre Chords. Once they are familiar with the shapes this track is a good way of learning how they’re used in practice. You’re playing mainly 7 barre chords. You may also want to review the first Basic Barre Chords lesson. (Use the Bm shape, but with the root on the 5th fret to get your Dm barre chord). This can also be used as a backing track for solo guitarists. The key is Gm. This lesson focuses on Maj, Min and Dom 7th barre chords with roots on the E and A strings. Dim and Aug 7ths will be covered in another lesson, (although in the Open 7th Chords lesson, you will find one barre chord for the Dim7 rooted on the A string), as will roots on other strings. 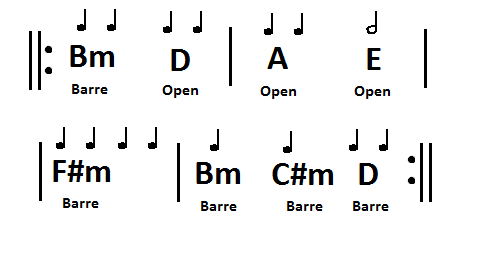 Compare the following chords to the Major and Minor barre shapes you have already learnt. Seeing the physical difference in what your fretting hand is doing, and noticing what notes are being replaced or altered will help you get a better understanding of music theory in general. It also serves as a good starting point towards altered chord theory as the sound of 7ths is so easily recognized. 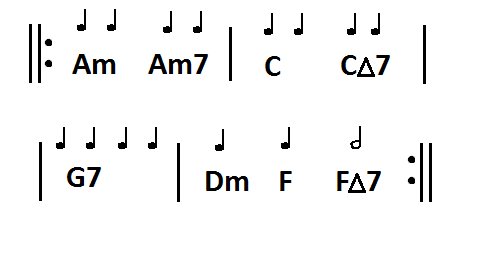 The chords in the Open 7th Chords lesson were all diatonic within the scale of C Major. Differently, here we will be examining chord shapes with no real regard to a specific key. You may want to refer back to that lesson to remind yourself where these chords lie within a diatonic scale. You could also try playing the barre open 7th chords you already know as barre chords. It may also be useful to refer back to the first Basic Barre Chords lesson, as some of those shapes are used and altered here. Here are some tips to help you fret each chord. 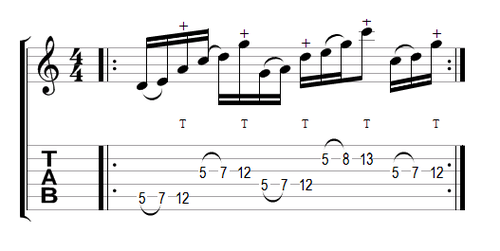 F#Maj7 – There’s 2 ways to fret this chord. The first option assumes you have an especially large thumb, in which case you fret the 2 middle strings with your 2nd and 3rd fingers, then the B string with your 1st finger, using your thumb to fret the root on the E string. Option 2, you use your first finger on the root note, your 2nd finger to get the B string, and your 3rd and 4th fingers on the middle strings. You also need to try and mute the A string, whichever fretting you choose. F#Min7 – Here you can use your 2nd finger to get the root note on the E string, and your 3rd finger barres the other 3 notes. You can use a combination of both fingers to mute the A string. 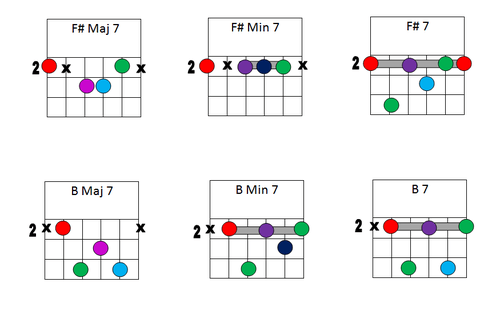 F#7 – This is the easiest 7th chord of all. Play the F#Maj barre chord, then simply release whatever finger is fretting the D string. Done. BMaj7 – Use your first finger to fret the root on the A string, then your 3rd finger to get to the D string. The, use your 2nd finger on the G string, and your 4th finger on the B string. Take care not to play either of the E strings. BMin7 – This is pretty simple. Play the Bm barre chord that you already know, then raise whatever finger you have f the G string. B7 – This is also really easy. Play a B barre chord, and raise whatever finger you have on the G string.